We have now entered a new digital age, and As we move towards the future, we embrace evolution, knowing that everything we interact with in our everyday lives will improve, be enhanced in its performance and potentially customised by its users. Features shift, defaults disappear, menus change. In India, Construction sector will remain buoyant due to increased demand from real estate and infrastructure projects. On the other hand, construction industry is one of the least automated industries that feature manual-intensive labor as a primary source of productivity. Automation of processes and systems, increasing the use of technology in everyday tasks, and autonomous machinery seems like a far-fetched fantasy out of a sci-fi film for construction industry. Construction industries are constantly seeking ways to cut costs in several aspects of the business, from construction surety bonds to business management tools. However, the current environment of construction industries have pushed the need for digitization ahead in a short period of time. As a highly unautomated industry, construction is poised for a robot revolution and hence, construction robots will have a major impact on this industry. That said, the future of construction now is related with machines, with human and machine interaction, with automated robotics and artificial intelligence. Such prowess directly addresses India’s massive need for infrastructure development. Hence, this is directly related to current architecture design practicesand the idea is to facilitate these practices towards a more sustainable way of building, inhabiting, and rethinking our construction techniques. The Global Summer School India node aims to establish a manifesto to make architects, designers and engineers as innovators and change agents in the construction industry. By way of introducing robotics and automation in construction, and focus on revolutionizing technology and processes to address real world problems and provideinnovative solutions that are optimised and sustainable. During the workshop, participants will explore a series of methodologies looking to incorporate advanced design thinking, generative algorithms and dynamic material feedback to existing industrial processes, accompanied with novel interfaces for robotic programming and large-scale automated construction. The first of these was the investigation of multi-scalar modelling techniques and an aim to better understand their potentials within the discipline of architectural design modelling for generative, analytical, and fabrication-related processes. The potentials of a multi-scalar modelling approach explored here apply to the computation of specific material properties in the context of experimental structural systems and digitally-driven production processes. Articulated to challenge the quality of feedback between design, material properties and making. ‘Robots in Construction’ is an initiative by Global Summer School India to repurpose the construction process to change the way we build and develop processes and design tools, to have mass customized architectural elements at no additional cost using Digital and advanced Robotic Fabrication. IAAC Global Summer School is a full-time two weeks course, 1-14 July 2019, that provides both practical and theoretical knowledge. The program is led by expert tutors, combined with lectures by renowned professionals and academics relevant to the topics to be treated during the course. These will be broadcasted in the different node-cities, all globally connected. Participants will join a global agenda and an international laboratory at their disposal to test their design hypothesis, understanding how design conclusions derived locally can be tested and evolved globally in the different cities where other teams reside. Introductory sessions are going to be organized for participants in topics ranging from parametric and associative modelling in Rhino/Grasshopper to prototyping and electronics with Arduino.During the workshop participants will have the opportunity to explore form finding strategies through theoretical and practical scripting sessions with computational design tools, Investigating the material and its structural implications through KUKA 6 Axis robotic tools and scale model making which later on will be built as a series of digitally fabricated architectural elements in 1:1 scale, embedded with smart sensorial interaction. Led by tutors from Leading design research programs, IAAC/Barcelona, BNCA/Pune and professionals from the field of architecture and engineering. 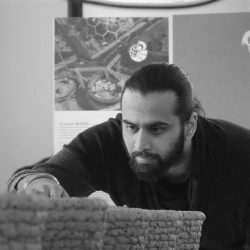 Kunaljit Chadha is an Indian architect and a Digital fabrication and Robotics expert.His early work experience at Menis Arquitectos (Spain) helped him develop his curiosity towards materiality in architecture. Later to further investigate in this domain he pursued his masters at Institute for Advanced Architecture of Catalonia (IAAC) in Spain. He has been involved with a dynamic range of projects from Computational Design to Robotic manufacturing to Interactive installations in collaboration with architects, technicians and artists.His research interests involve human machine collaboration and through this synergy, form a cognition between design, matter and production. Kunal is also currently active in academia through workshops and seminars in India ,Spain ,Iran ,France ,United Kingdom and so on. Continuing his affair with ‘Machines Making Architecture’, he joined the R+D department at IAAC as a Robotic fabrication researcher in 2016. Architect, Faculty for M. Arch (Digital Architecture) at the Dr. B. N College of Architecture, Savitribai Phule University of Pune, India. 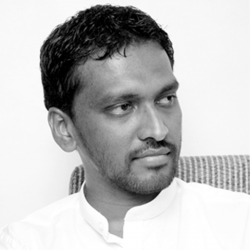 Deva Prasad holds a Master of Architecture in Digital Architecture from the School of Architecture and Planning,Chennai. He is a computational designer currently investigating algorithmic techniques in relation to computational geometry, material computation and interactive design with interests in applying these techniques to prototypical assemblies as well as architecture. His areas of interest lies in exploring digital to physical workflows that circulate openly between computation, simulation and physical prototyping utilizing emerging digital design tools. Architect Swapnil Gawande has completed his Masters in Emergent Technologies & Design from the prestigious Architectural Association London. He specializes in generative design methodologies involving computational techniques, advanced material sciences and technologies within the domain of architecture and urbanism. These initiatives are undertaken in his design collective – STUDIO_DRA[AFT], which rigorously implements a research based design methodology to provide novel solutions at different scales. He has won several accolades especially for designing and executing complex steel structures. 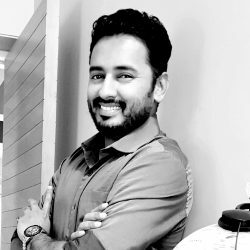 He is associated with MKSSS’s Dr. Bhanuben Nanavati College of Architecture (BNCA)’s Department of Digital Architecture as an Assistant Professor and is also actively involved in conducting lectures, seminars and collaborative workshops while been invited as an eminent Speaker to showcase his works at several national and international platforms. 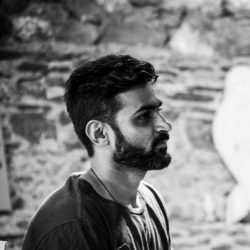 Chirag is an architect, with expertise in computational design and digital fabrication. After completing architecture from CEPT, India, he furthered his interest through researching and developing interdisciplinary skills of advanced architecture architectural and parametric design at Institute for Advanced Architecture of Catalonia (IAAC) in Spain, followed by expertise in digital tools and digital fabrication by graduating Fab Academy (Course by MIT’s Center For Bits and Atoms) from Fab Lab Barcelona. He is partner at Noumena as well as involved with RESHAPE – Digital Craft Community and NERO | Netwokring Environmental Robotics, Barcelona, Spain. He has also been visitng faculty at IAAC(Spain), Fab Academy(Spain & Italy), CEPT(India), VMCA(India), TDV(India). Currently, he is setting up D3lab | Digital Design Dimensions; an advanced manufacturing lab for architecture practice in India. IaaC Global Summer School India 2019 will take place at the Digital Fabrication Lab (DFL) curated by Department of Digital Architecture at Dr. Bhanuben Nanavati College of Architecture for Women (BNCA), Pune, maharashtra, India. The DFL (BNCA) has three work cells namely, the laser work cell with 2 nos laser cutting & engraving machines, the 3D printing work cell with 2 nos 3d printers and the robotic fabrication work cell with 1 cnc router & milling machine and 6 Axis Kuka robot. These work cells can facilitate diverse range of processes. A KUKA KR-30 machine is a recent addition to the [DFL] suite of digitally driven tools, enabling a wide range of applications. These tools are supported by traditional metalworking tools and assembly areas as well as collaborative teaching workspaces. After the course, the participants will have gained theoretical and applicative knowledge about advanced design strategies. They will be familiar with parametric software, data visualization and use of digital machines. The last day of course participants will join a presentation of developed projects reviewed by a renown jury and will receive a Global Summer School Diploma certificate by IAAC. Fee for India is 650 € for students and 875 € for professionals, all taxes included and limited seats only. Please get in touch on gssindia19@iaac.net to know more. Early Bird Offer ticketed on First Come First Serve. All the fee includes all material costs needed for the course. No additional registration fee is required. Flight tickets, accommodation and food are not included in the fee. Each participant should bring his/her own computer with the software installed. Further details about the software will be given to the participants upon acceptance. In order to register to the Global Summer School, participants need to submit the online application form, where they will be asked to fill their personal details. Portfolio is not mandatory. GSS19 dates are from 1-14 of July 2019. Application are open until the end of May 2019.